Spend 12 Days Exploring three of India’s top national parks on multiple game drives in open 4x4s—you won’t find a fuller wildlife-focused itinerary! The Indian subcontinent is one of the world’s most stimulating destinations. While its mélange of human cultures has long drawn the attention of historians and travelers, its spectrum of wild habitats rich with exotic animals offers rare treasures for those who are passionate about nature. This comprehensive safari focuses on India’s natural realm, renowned for its dramatic rivers, fabled jungles and intriguing wildlife, including the majestic Bengal tiger. Ecotourism is integral to conservation in India, and our travels directly benefit the continued existence of some of the world’s most precious vanishing species. Explore three of India’s top national parks on multiple game drives in open 4x4s—you won’t find a fuller wildlife-focused itinerary! Arrive in India’s capital of New Delhi and transfer to the luxurious Taj Mahal Hotel. This afternoon, explore India’s vibrant capital on a rickshaw ride that reveals the many layers of its complex and captivating history. We also take a stroll through the bylanes of Old Delhi and visit Jama Masjid, India’s largest mosque and the architectural magnum opus of Mughal Emperor Shah Jahan. Built in the mid-17th century, the stunning creation is constructed of alternating vertical strips of red sandstone and white marble, with a vast inner courtyard that can hold 25,000 people. After a thrilling introduction to the country, we enjoy a welcome dinner this evening and an orientation to our India tiger safari by our Expedition Leader. Transfer early this morning to the Delhi airport for our flight south to Jabalpur. Our Indian adventure continues as we journey by road through the bucolic countryside of rural Madhya Pradesh en route to Bandhavgarh National Park. 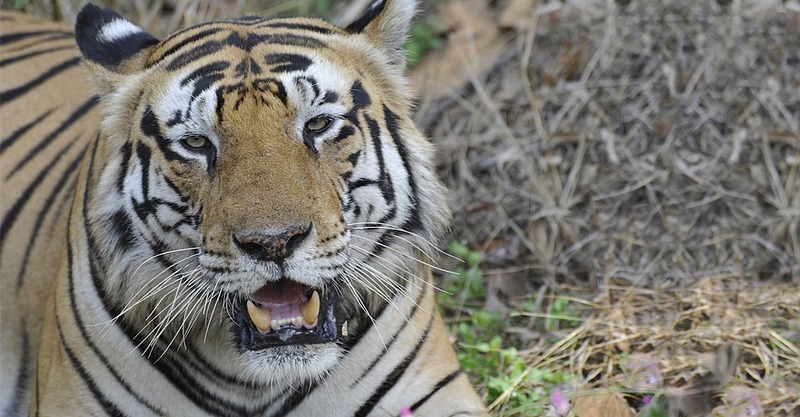 An essential stop on any serious tiger safari, Bandhavgarh is renowned for one of India’s highest concentrations of this magnificent endangered cat. On arrival, we check in to Kings Lodge, surrounded by wild natural forest just outside the park boundary. After getting settled and enjoying lunch, we set out on our first wildlife drive in open 4×4 safari trucks. Over the next two days we explore the park’s varied habitats on morning and afternoon wildlife drives. Bandhavgarh was established as a national park in 1968 and declared a protected tiger reserve under Project Tiger in 1993. At 444 square miles, it is a relatively small park with a thriving tiger population, offering guests a good chance of encountering this lord of the jungle, as well as a selection of other exotic wildlife. Predominantly covered with sal and mixed deciduous forest, thickets of bamboo and expansive grasslands that line the stream valleys, the park’s hilly terrain harbors one of the highest densities of tigers in the world. Bandhavgarh was once a prime hunting reserve for the Maharajahs of Rewa, where Maharaja Raman Singh himself shot an astounding 111 tigers by 1914. Today it is one of the premier pacesetters in tiger protection. With tigers at the apex of the food chain, Bandhavgarh’s rich biodiversity includes a multitude of other fauna. We’ll hope to see a sampler of its 37 mammal species, among which are leopard, jungle cat, civet, wild boar, sambar, spotted deer, muntjac (barking deer), sloth and Asiatic jackal. If we’re exceptionally lucky, we might spy striped hyena or dhole (wild dog). Some 250 bird species, 70 different butterflies and various reptiles round out the diverse wildlife population. After a last morning wildlife drive in Bandhavgarh, we head on to Kanha National Park, in the heart of the Kanha Tiger Reserve. Situated in central India in the Satpura Hills, Kanha National Park covers 750 square miles of rich and varied wildlife habitat. Its lush sal and bamboo forests, grassy meadows and ravines provided inspiration to Rudyard Kipling for his famous novel The Jungle Book. Kanha National Park was established in 1955 and forms the core of the Kanha Tiger Reserve, created in 1974 under India’s Project Tiger. The park’s landmark achievement is the preservation of the rare hard-ground swamp deer (barasingha), saving it from near-extinction. Stringent conservation programs for the overall protection of the park’s fauna and flora make Kanha one of the most exemplary national parks in Asia. From our ecolodge base, located in the tiger heartland of the world, we have the chance not only to learn about the tiger and its habitat in depth, but also to experience ecologically responsible tourism and see conservation at work benefitting local communities and the tiger reserve itself. We spend two more full days in search of Bengal tigers and other wildlife on excursions through the park in open 4×4 vehicles. Scenic Kanha, once a hunting ground for imperial rulers and viceroys, is now one of India’s most important conservation reserves. With ideal habitat for tigers and their prey, it offers some of India’s best tiger viewing, though it can take effort to locate them in the sun-dappled scrub forest that provides superb camouflage for many species. Dawn arrives each day with an early-morning game drive, entering the park just as the sun’s rays are breaking over the jungle. The open meadows where herbivores graze attract tiger, leopard and wild dog to the edges of the clearings, and we’ll hope for the good fortune to see some of these stealthy predators. The Banjaar River, which forms the park’s southwestern border, provides a steady water source for the abundant wildlife. Verdant jungle interspersed with vast grassy meadows called maidans support a range of species similar to those found in Bandhavgarh. Other mammals we might see here include chowsingha (four-horned antelope), common langur, gaur (the world’s largest wild oxen), rhesus monkeys and occasionally leopard. Kanha is also home to one of the world’s last populations of barasingha, an endangered swamp deer with 12-point antlers. At the close of each day we retire to the inviting comfort of our lodge, including a refreshing swimming pool and spa. After a last morning wildlife drive in Kanha, we drive to Raipur, then fly to Kolkata (Calcutta). Our luxury hotel provides a lavish and restful layover point as we transit from one region of the country to another. The first hotel in the world to be registered by United Nations Framework Convention on Climate Change for Carbon Emission Reductions, the ITC Sonar provides a resort-like urban oasis in one of India’s most bustling cities. The enchanting expanse of beautifully designed gardens is shaded by more than a million trees and accented with serene ponds dotted with water lilies. Though its architecture is sleek and minimalist, the hotel’s décor and ambience celebrate the golden age of Bengal during the reign of the Pala dynasty, an era of extraordinary cultural advancement. Located outside the city center, the hotel provides convenient accommodations for our airport departure tomorrow. This morning we fly from Kolkata to Jorhat, the tea capital of India, then drive to Haroocharai Tea Estate. Following lunch on the grounds, we embark on a tea garden tour where we may observe local workers harvesting leaves, as well as learn how raw leaves are processed into tea. After our visit, we continue by road to Kaziranga National Park in Assam. The park, which borders the sacred Brahmaputra River, was created in 1926 as a refuge for the one-horned rhinoceros. Once hunted nearly to extinction, today this two-ton beast is a conservation success story, rebounding to more than 1,600. Two-thirds of the world’s population is found within Kaziranga National Park. In addition to the rhino, the park is home to some of India’s other largest mammals including Asian elephant, Asiatic wild buffalo and barasingha. We stay at the Diphlu River Lodge set within lush grounds boasting more than 40 species of trees and some 200 species of shrubs, creepers and climbers. Morning and afternoon 4×4 drives reveal Kaziranga’s diverse habitats, a mix of elephant grass, thorny rattan cane, tracts of semi-evergreen forest and shallow marshes. Stretching from the banks of the Brahmaputra River to the dense forests of the Mikir Hills, the reserve boasts an amazing variety of wildlife. In addition to one-horned rhinoceros, we keep a close eye out for buffalo, elephant, wild boar, hog deer, hoolock gibbons, sloths and pythons, as well as the elusive Bengal tiger. The national park has been declared an Important Bird Area by Birdlife International and is home to a great variety of resident and migratory birds. Drawn to the life-giving artery of the Brahmaputra, waterfowl abound, and we may see egrets, pond herons, river terns, black-necked storks, fishing eagles and pelicans. In the river itself, we look for otters, gharials and rare Gangetic dolphins. This evening, revel in tales of our Indian safari adventures as we gather for a farewell dinner together. After breakfast this morning, we set out for the half-day drive to Guwahati to catch our afternoon flight to Delhi. Day rooms have been reserved for an afternoon at leisure, with a transfer included to the international terminal to meet departing flights later this evening. Special Note: National parks in central India are closed on Wednesday afternoons. Should a portion of our visit to Kanha or Bandhavgarh fall on a Wednesday, we will have alternate afternoon activities planned in place of a wildlife drive. Prices are per person based on double occupancy and are given in US Dollars. Nov & Dec 2016 and all 2017 fees may change slightly. Dates for Nov & Dec 2017 are tentative and will be allocated to guests on a first-come, first-served basis. Guests who reserve their space prior to final pricing confirmation will receive the lowest rate within the range offered.